Today I have a really cute tuff spot idea for you from Monkey and Mouse. 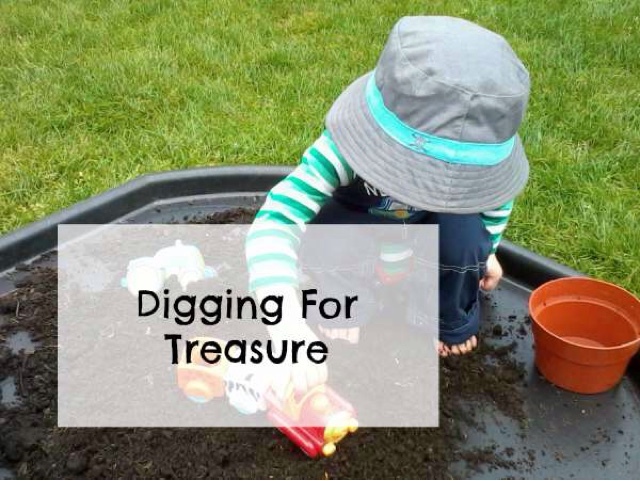 There's nothing better than digging for treasure and this is a perfect way to keep a little occupied for a while. Hi, I'm Jenny from Monkey and Mouse and I am honoured to write a guest post for the lovely Leandra. 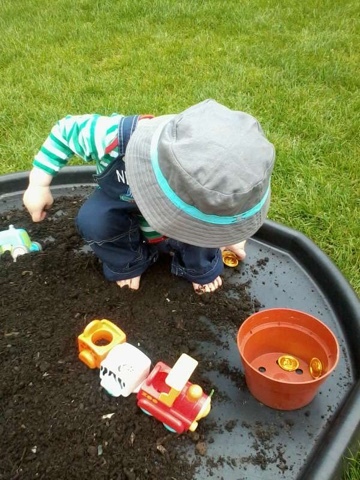 These photos were taken when O was only 2 and I needed to think of something simple to occupy him in the garden. I had recently bought some plastic pirate coins from the Poundshop thinking they could be useful for a project and of course I decided that we needed to dig for pirate treasure! I buried the coins in a heap of soil (on the tuff spot) for O to dig around in and find them, I suggested he could wear an eye patch, but he wasn't up for that. 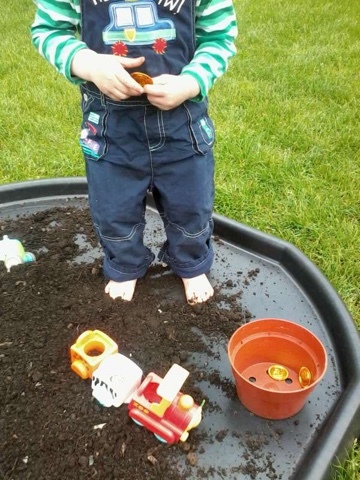 He spent some time digging and finding the coins, then hiding them again, but when he was finished with the digging he went and fetched a toy train (my train mad boy!) and continued playing in the soil for at least another hour. Who knew soil was so exciting?! Why don't you hide some pirate treasure for your little one? Great idea Jenny, I need to get a tuff spot for home! Fab idea. My girls love digging but sadly it's usually my flowers! !